Rory McIlroy's parting shot put his "nearly" season in context, as Danny Willett ended a 952-day drought at the DP World Tour Championship in Dubai. As the Holywood star joked about needing "a brain transplant" following a frustrating season, an emotional Willett returned to the winner's circle for the first time since he won the 2016 Masters. The Sheffield golfer (31) put more than two years of poor form and injury behind him by making three birdies in his last five holes to hold off Matt Wallace and current Masters champion Patrick Reed. As Willett's closing 68 gave him a two-stroke win on 18-under par, McIlroy reflected on a year of missed opportunities, such as the chances he had to win the Masters or The Open. "The margins are so slim and this year I've just been on the wrong side of it, but there's been a lot of good in there," McIlroy said after closing with an untidy 73 to finish tied 20th on eight-under par, 10 behind Willett. "Another year it could have been a different story and all of a sudden you have four or five wins and you are feeling really good about yourself." While he had one win, three runner-up finishes and another six top-10s in 25 starts worldwide, McIlroy could not help but think about the ones that got away as he headed into a winter break with issues to resolve - his putting, his wedge play, his equipment and, as a consequence, his driving. "I have just got to keep doing what I have been doing and working on the right things," he said. "I have a few technical things to work on over the off-season and hopefully come back and start the season off on a positive note." Jokingly, he added: "After this season, what I need is a brain transplant." With his European Tour membership still up in the air, McIlroy will be best man at caddie Harry Diamond's wedding, attend Ollie Fisher's nuptials and spend Christmas with his in-laws in upstate New York before returning for the PGA Tour's Sentry Tournament of Champions on January 3. Shane Lowry and Paul Dunne, meanwhile, will team up for this week's ISPS Handa World Cup of Golf in Melbourne after concluding mixed seasons with mixed weeks in Dubai. 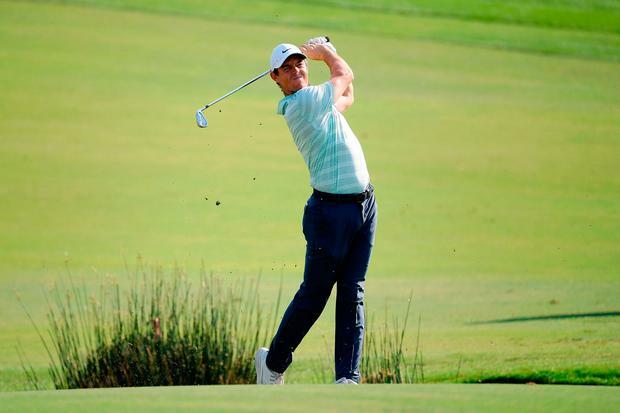 The Offaly man followed a third round 69 with a 73 to tie for 30th on four-under, picking up €62,136 as he finished 44th in the Race to Dubai, with official prize money this season of €897,222 from just 13 European Tour starts. Dunne, who won €44,559 and tied for 41st on two-under after a closing 70, ended the year ranked 54th in the Race to Dubai with official earnings of €798,981 plus an extra €100,000 for winning the unofficial GolfSixes with Gavin Moynihan in May. As for Willett, who was tied for the lead with Reed starting the final round, he completed his return to the winner's circle with a gutsy performance down the stretch recording three birdies in his last five holes to win by two from Wallace (68) and the American (70). Open champion Francesco Molinari was crowned European No 1, finishing more than 1.32 million Race to Dubai points ahead of Reed after finishing 26th on six-under in Dubai, with Tommy Fleetwood third. Meanwhile, Charles Howell III won for the first time in more than 11 years when he beat Patrick Rodgers (26) with a birdie at the second playoff hole in the RSM Classic at Sea Island in Georgia - after both drew level on 19-under. Graeme McDowell (39) closed with a four-under 66 to finish tied 11th, five strokes outside a playoff on 14-under to earn $140,800 in the final official event of 2018 after Pádraig Harrington and Seamus Power missed the two-under par cut by one stroke. Elsewhere, disabled Dundalk amateur Brendan Lawlor (21) finished second in the Australian All Abilities Championship at The Lakes in Sydney.